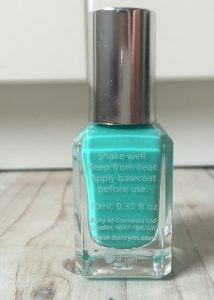 I recently purchased some BarryM Nail Paint, something I had never used before. 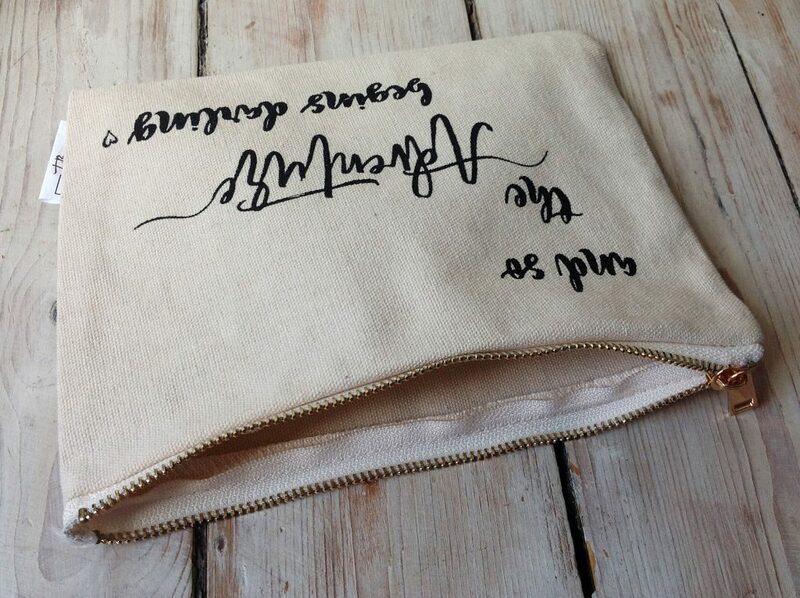 If anyone entered my recent giveaway you’ll remember I gave one of them away, a lush pink colour. 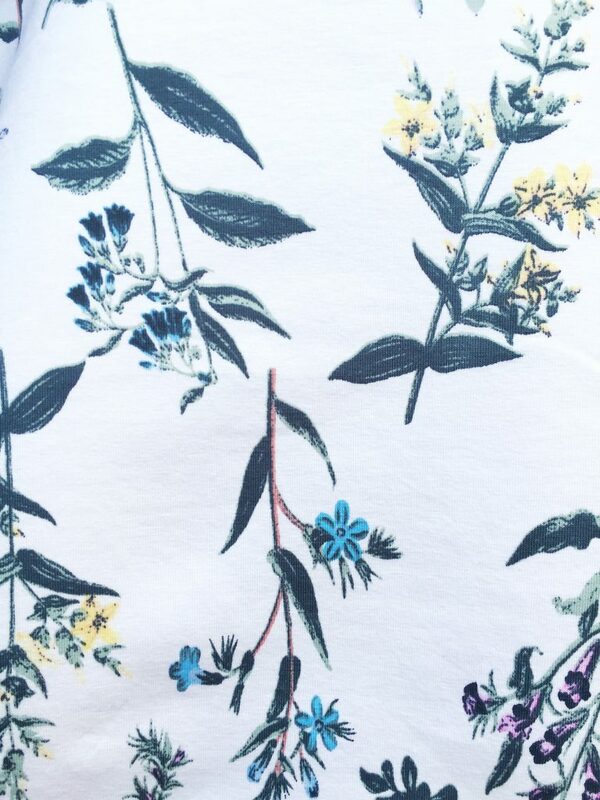 But another of the shades that I kept for myself was this incredibly bright turquoise colour. Like the shade that the sea is in faraway climates. I adore these sorts of colours; in fact the majority of my nail varnish collection is a mixture of blues, greens and reds. Having read the packaging attached to the bottle I noticed that it said to apply a base coat underneath this polish. So I prepared my nails, filed and buffed, before applying two coats of my usual top coat, Rimmel London’s clear 60 seconds polish. 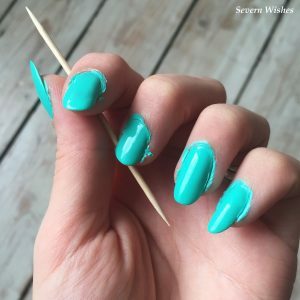 I felt I was ready to apply the nail paint and braced myself for what the brush would be like. It was a regular size brush (I have quite slim nails) and the bristles seemed firm and durable as I applied the first brush stroke to my left thumb. 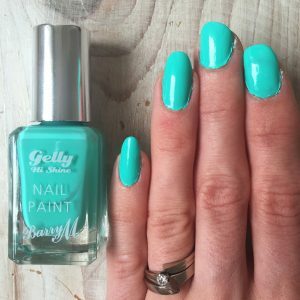 When I initially began to apply the BarryM Gelly Hi Shine Nail Paint the first thing I noticed was how thick and shiny the polish was. It looked good inside the glass bottle, but sometimes the look of nail varnish can differ once applied. However with this the colour was not only accurate but it was bright and super glossy. After I applied two coats of the nail paint I allowed my hands to dry for around 10 minutes, when I lightly touched the polish it still wasn’t completely dry in places. So I would recommend that you stay in a ventilated room or wave your hands up and down to dry out your nails. Honestly, I am used to the quicker nail polishes so I wasn’t sure what else to do. 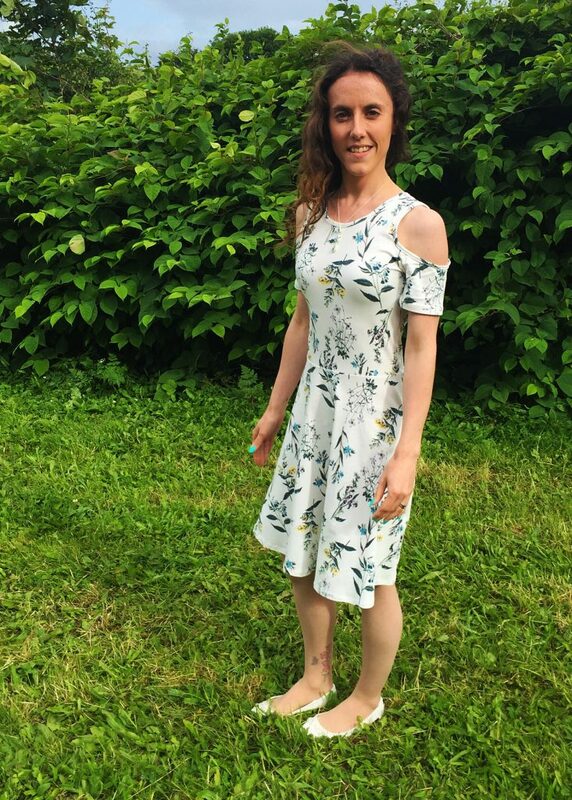 I have since read that sunlight or warmth helps, however it was a grey day when I applied it, so waving my arms around like a lunatic was my solution. Once dry I attempted to remove the excess that almost always spills over on my small dainty finger nails. My hack for you (if you have the same issue) is to gently use the pointed end of a toothpick to nudge the dried varnish away from the skin. It can then be gently pulled off without disturbing the manicure. So how impressed am I by this nail paint? Well I will begin by saying it looks amazing, the quality of it once fully dried is impressive because it is so shiny and smooth. When I tried to take photographs of my nails there were reflections on almost all images. This simply enhances the fact that I think my nails were the shiniest they have ever been with any kind of polish or paint! Another wonderful thing is the colour, it was vibrant and what you see in the bottle is a matte version of the shiny shade you’ll receive on the nail itself. I am more than happy with the experience that I have had with this new purchase, and I would definitely consider getting more colours of this type of nail paint, in my opinion the quality is worth the price in this case. My only criticism is how long it takes to dry, I did have to redo one nail because I thought it was dry, only to crease it and have to reapply the nail paint to the ruined nail and then wait again for it to dry completely. You of course cannot do anything during this time in fear of damaging the fresh manicure. So this type of nail paint is only good if you have the time and patience to apply and allow for it to dry. 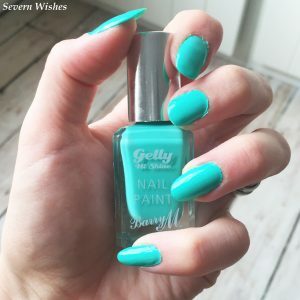 Comparing this nail paint to the reviews I did of Rimmel London’s Super Gel and the Essie nail lacquer I would say that BarryM Gelly Hi Shine stayed shiny for longer. The initial application of all these polishes made my nails smooth and shiny, but the BarryM seems harder wearing. 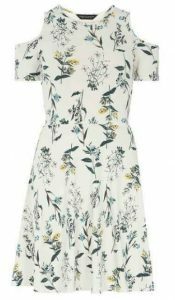 I didn’t wear it for anywhere near as long as I did the Rimmel London however, so I cannot review this on a length of time versus quality comparison. What I can tell you is that the BarryM took a lot more effort to remove than any of the other polishes I have reviewed. And I feel that the glossy and vibrant look of this nail paint speaks for itself in both quality and appearance. 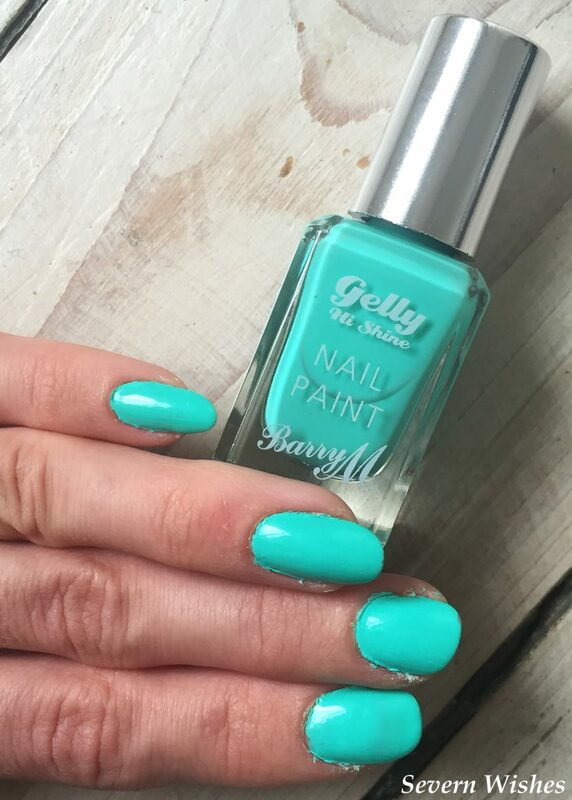 I hope you have enjoyed this review, if you use Barry M I would love to hear your recommendations, leave me a comment. 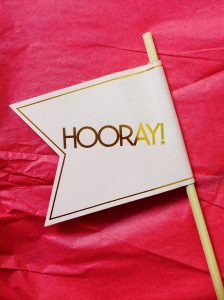 I’ve been very lucky this month because I have another Treatbox reveal for you all! I am happy to share this months theme with you first of all which is a Tropical theme. So where to begin! 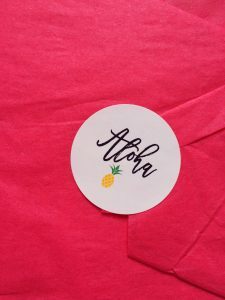 Well I will start with saying how I laughed out loud when I opened the box, the sticker read ‘Aloha’ and inside the box was a bright pink paper and an interesting smell like coconut. 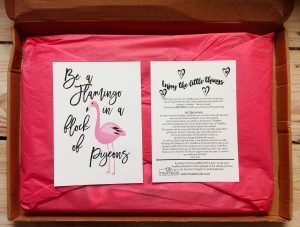 There was a card that read ‘Be A Flamingo In A Flock Of Pigeons’ which I’m sure plenty of us can relate to. 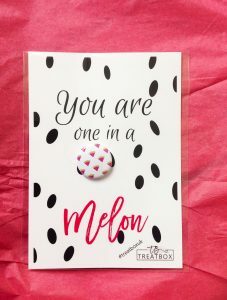 After my chuckle was over I read the description card and was surprised to read that TreatBox had now been going a year, so congrats to Zoe and her wonderful business! 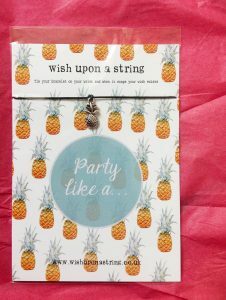 As I carefully opened up the tissue paper I noticed the smell getting stronger and I could see something made of material, what I guessed was the party bag with spots on and in the corner was something covered in pineapples! 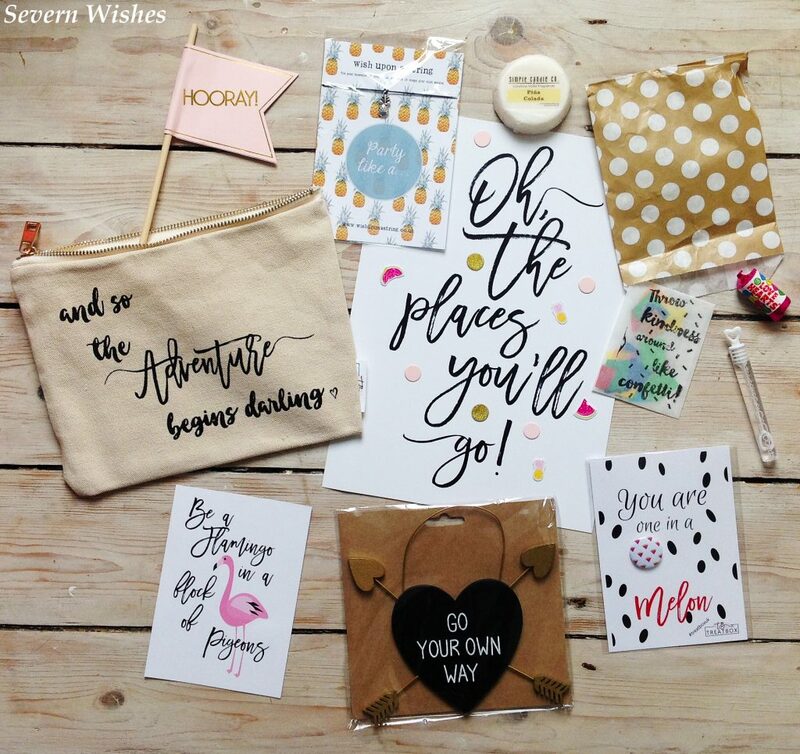 Inside this months box you will find some wonderful items including the little party bag mentioned in the description in celebration of a year of TreatBoxes, which had bubbles, confetti and sweets inside it (cute! 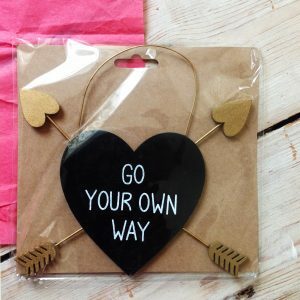 ), a ‘Hooray’ flag (which is great for any celebrations), a badge that has melons on it, a lovely makeup bag which has the slogan ‘and so the Adventure begins darling’, a heart and arrows sign which reads ‘Go Your Own Way’, a bracelet from Wish Upon A String which is a Pineapple, an inspirational card that says ‘Oh The Places You’ll Go’, and a candle which is Pina Colada scented from Simple Candle Co. (it made the whole box smell lovely). Did anyone else start singing or humming the Pina Colada song while going through their treats? Because I did! You know the one? 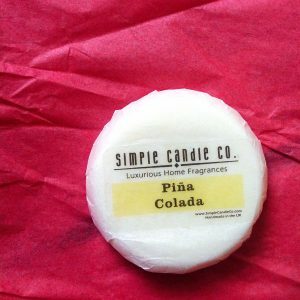 “I like Pina Colada’s and getting caught in the rain!” Mainly I think was because the smell was so nice throughout the whole box because of the candle, it reminded me of the smell of the drink. 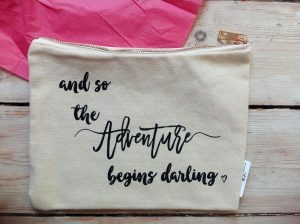 My favourite item in this months box has to be the quote bag. 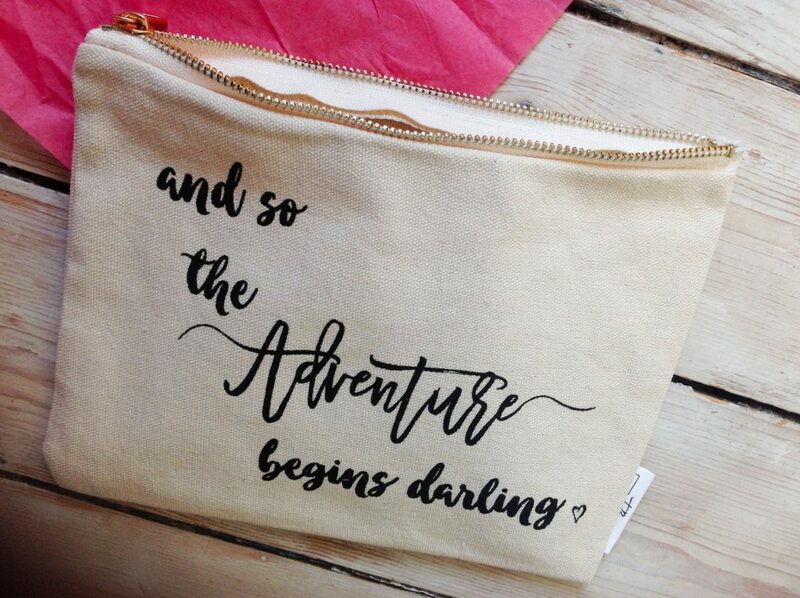 I really like the delicate font on the front. 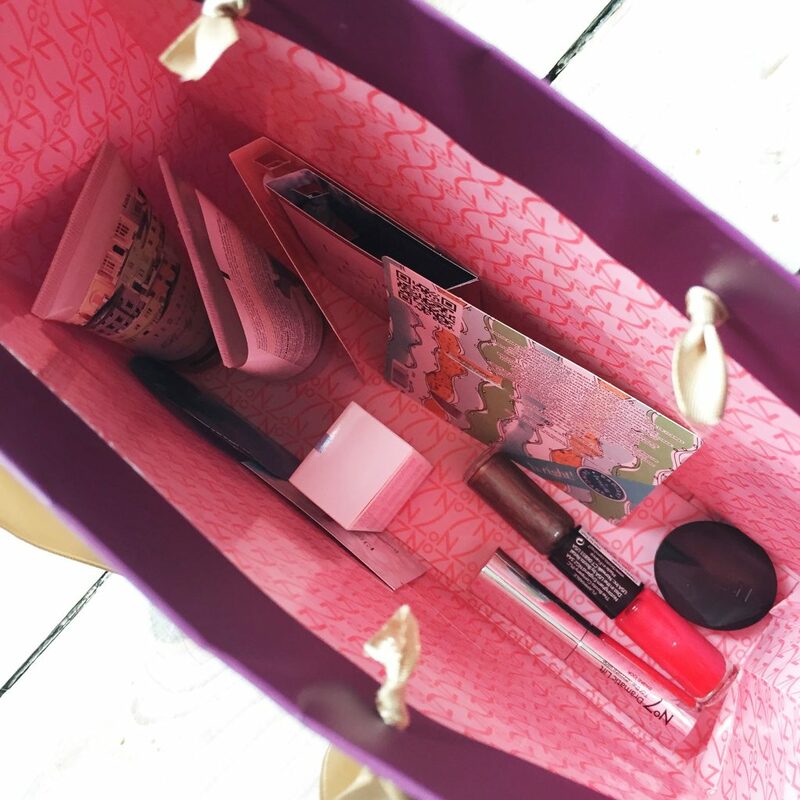 I’m a huge fan of storage items no matter what the material, and I’m positive that this little bag will go away with me on holidays and long weekends. 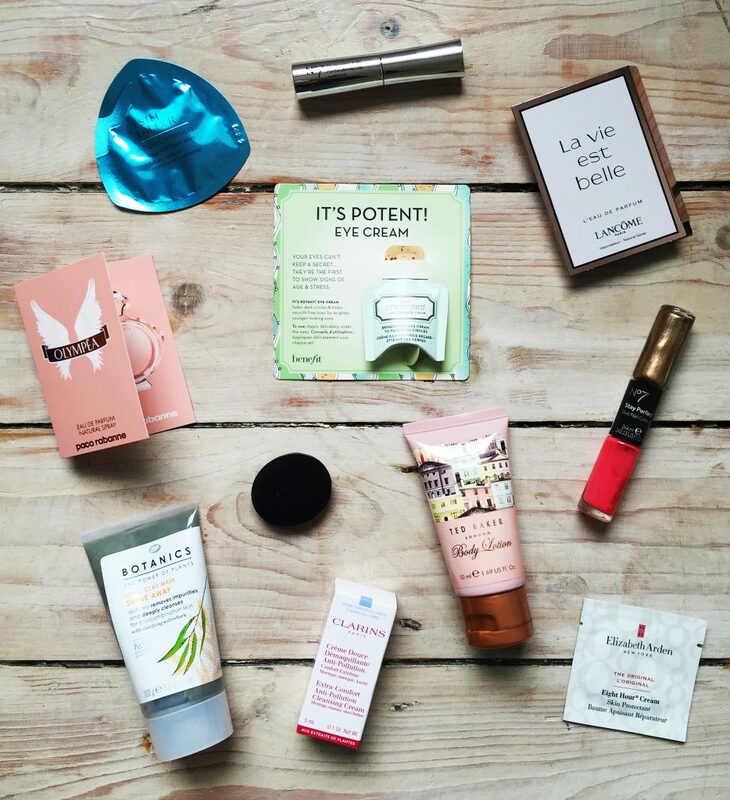 It’s a versatile size and I love that it can fit a lot of different items in, because it isn’t designed to be makeup specific for example, but I would most likely use it for that, or perhaps weekend accessories such as jewellery and things of that nature. I really love how much thought goes into these Treat Boxes. 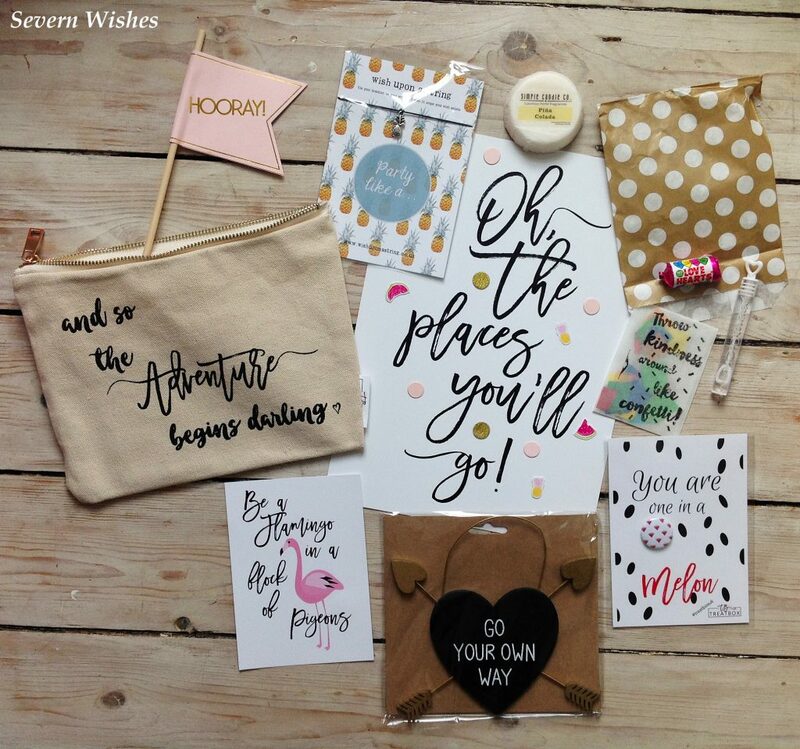 It must be difficult to come up with such great themes and gather the various items needed for each individual box. 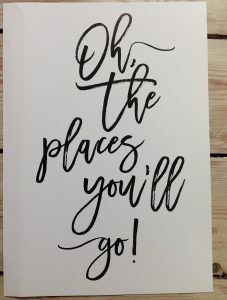 I am also very fond of all the inspirational quotes too. 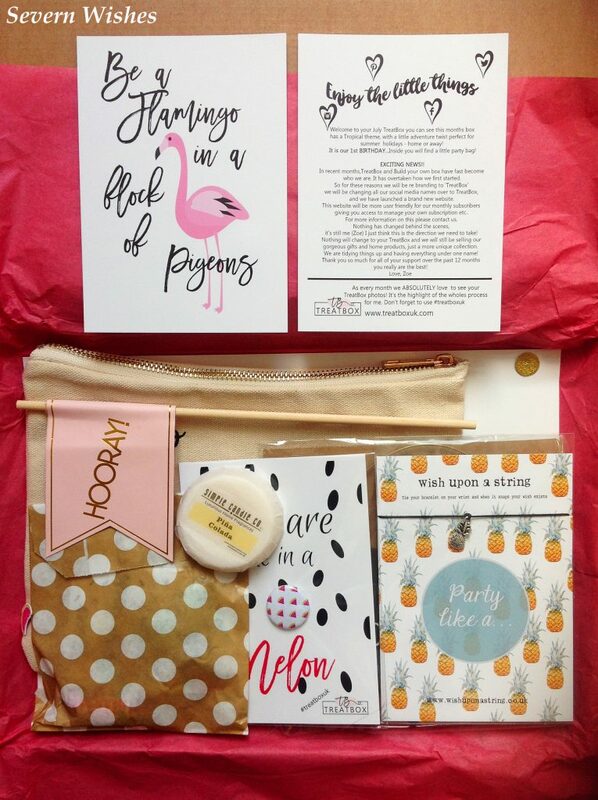 I have thoroughly enjoyed all four of my TreatBox experiences. Although I haven’t loved every item in every box, the great thing about these wonderful items is that the gifts that you receive that are unwanted, can become gifts for others who will love them. 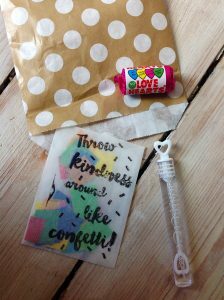 I know I won’t be purchasing too many little presents on the run up to this years festivities because I am saving a few of my TreatBox items to give away. 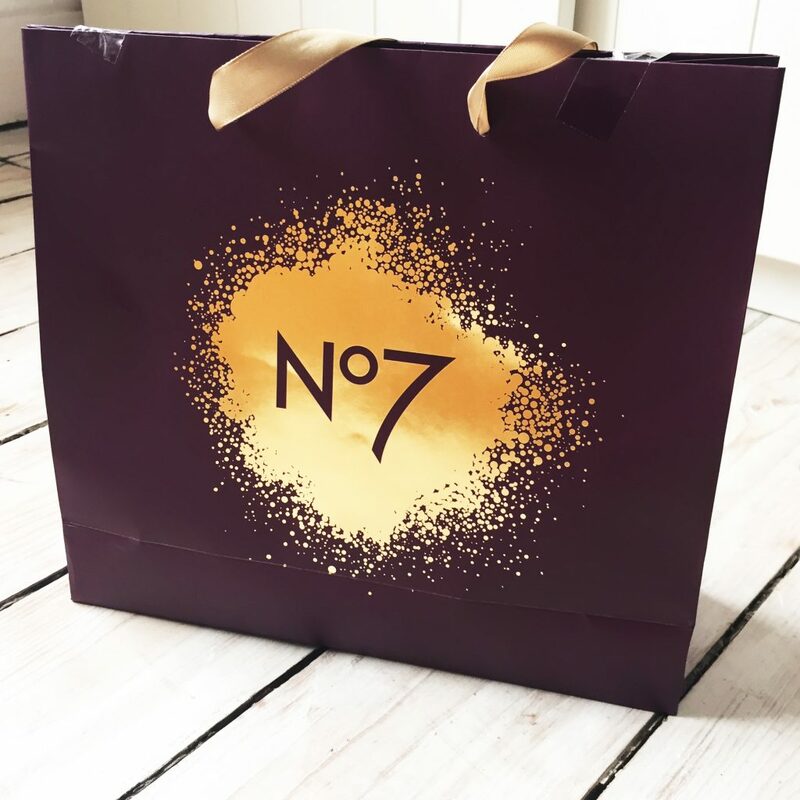 If you aren’t sure on whether to try a TreatBox for yourself or not I would say order a one off box, and then if you’re happy with it you can always subscribe afterwards. 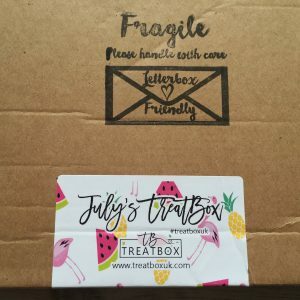 Check out my previous posts on the Treat Boxes I have received so far, in the unique category off my homepage called ‘Treatbox’ which is just for these reviews and reveals. 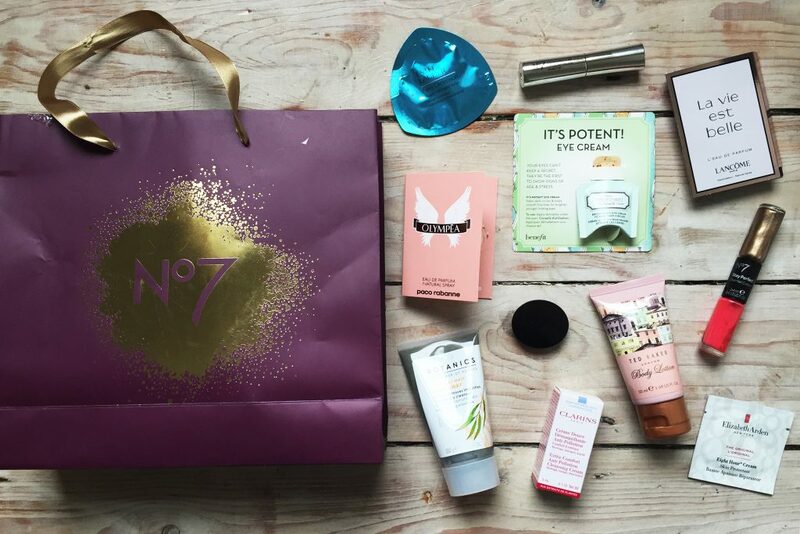 I hope you have enjoyed this reveal and review of the July Treatbox, who knows, we may have more of them in the future. 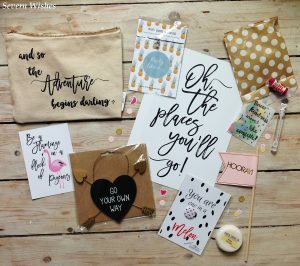 If you do decide to subscribe then please leave me a comment, I would love to know what you think of TreatBox.